DeltaDogz - Purely Positive Real Life Training - Positive professional dog training Melbourne. all you need for your perfect puppy. Find out more about our Puppy Training services. at home and away, on walks and in parks! Find out more about our Dog Training services. Get help for behaviour problems and enjoy life with your best friend. Find out more about our Behaviour Consulting services. Flexible private training to fit your needs and schedule. Train for real life situations. Video tutorials and detailed training notes. "Thanks for a great series of training sessions. 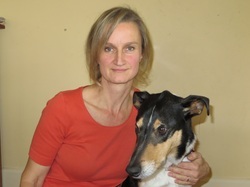 The experience has been invaluable – with very targeted advice to train desired behaviours in Milo to fit into our family life in and around the home, rather than obedience for its own sake which seems to be the emphasis of training at dog clubs." "Seb did the most amazing recall yesterday. He was rolling in something and appeared intensely absorbed in it but I thought I'd give it a go... He immediately stopped what he was rolling in and looked at me. I called his name and ran sideways a bit and he ran to me at such speed I was nearly in tears by the time he got to me :) Thank you for the work you did with us!" ... is a rock solid recall. Dogs who don't come back get little or no time off the leash. But even running for miles on a leash simply does not get your dog enough of the unrestrained work-out they get when they play with other like-minded dogs. Freely interacting with other dogs is key to your dog's mental health. A dog with pent up energy and frustrated social needs can become a nightmare to handle, and may become impossible to train. 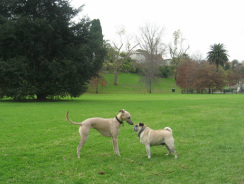 Contrary to some information found on the internet, ALL dogs can be taught to come back reliably, even sighthounds like whippets and greyhounds. It's easiest if you can start with a puppy, but even older dogs can learn this essential behaviour. Find out how DeltaDogz can help you train your dog. Enjoy Melbourne's off leash beaches! Oh I love to be by the seaside! Even in "peak season", there are a surprising number of off leash beaches in the Melbourne area - you don't have to stick just to the few fenced ones. Enjoy the sunshine (winter or summer) and explore a new beach today! For links, books, videos and lots of advice on anything from training to help with behaviour problems and health & husbandry questions, go to our Resources centre. Find news and opinions from the dog training world and the adventures of Rajah, Kiara and Giro on my blog. My dog journey started with Jessie, a small white fluffball bichon-schnauzer cross. She was trained the traditional way by choke collar and verbal praise. 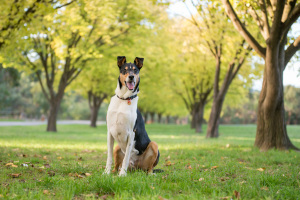 After she died, Giro, my Smooth Collie, taught me how wrong this approach was, and introduced me to the fascinating world of positive dog training. Kiara, my Whippet, reaped all the benefits, and can't wait for her training every day, all day!